I always joke that my entire paycheck goes directly to the Walt Disney Corporation. And with my Disneyland/Disney World annual pass, race registrations, and a couple of trips to Orlando per year it’s not that far from the truth. 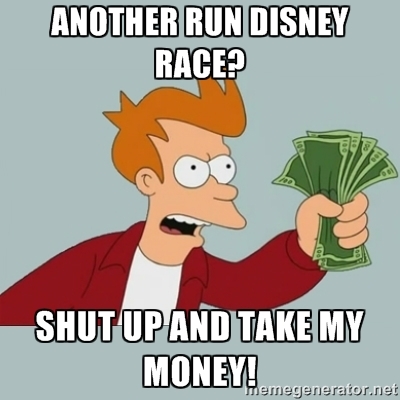 Not only did I just get back from Disney World two weeks ago, but over the last two months I’ve registered for four different Disney race weekends. Add up what all of those races cost me (Disney races are notoriously overpriced), including one related plane ticket I’ve already purchased, and my recent credit card bills have been extraordinarily high. I’m lucky to have a good job that pays well and a healthy bank account so I can afford these things that I enjoy so much, but they are most definitely luxuries. After this concentration of 2017 and 2018 race registrations, plus the holidays with gift-giving and irresistible sales, and a trip to Orlando on top of all that I need to think about how best to spend my discretionary funds. Over the last week (especially while I’ve been sick at home with only my laptop to keep me company), I’ve found myself looking at something online like a pair of shoes and thinking, “Those would be nice to have.” But then I realize that I already have enough shoes for just about every occasion so it would be a completely unnecessary purchase. This thought process has already saved me from a number of expenses. I even got a surprise gift card from favorite running apparel company the other day because I’m a member of their club, but I gave it to a friend so that I would avoid buying anything that I don’t need. I already have workout clothes coming out of my ears! Not only am I saving money, but I’m also avoiding augmenting the wardrobe that I purposely pared down over the holidays. I didn’t donate a carload of clothes to Goodwill just so I can acquire more. I’m hoping that by the end of the year I’ve saved enough money by skipping frivolous purchases that I don’t stress quite so much about those expensive race registrations or other bills from my favorite activities that come up in December/January. On a final note, I’m due to renew my Disneyland annual pass which I was planning to do this weekend. With two planned trips to Orlando during the next year (November and January) it makes sense for me to once again get the Premier pass that is valid in both California and Florida. The only problem is the huge upfront price tag. It seriously dwarfs a race registration cost. However, the Florida option will more than pay for itself after two Disney World vacations so it’s kinda of a no-brainer. It doesn’t really help me fulfill this New Year’s resolution, though!